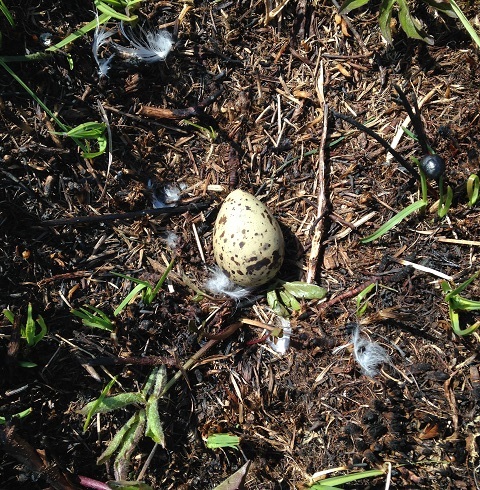 Petit Manan Island is in peak hatching season! The small, delicately speckled brown tern eggs are disappearing and being replaced by similarly patterned fluffy chicks. The oblong, white-brown spotted black guillemot eggs are opening up to reveal all-black downy chicks. 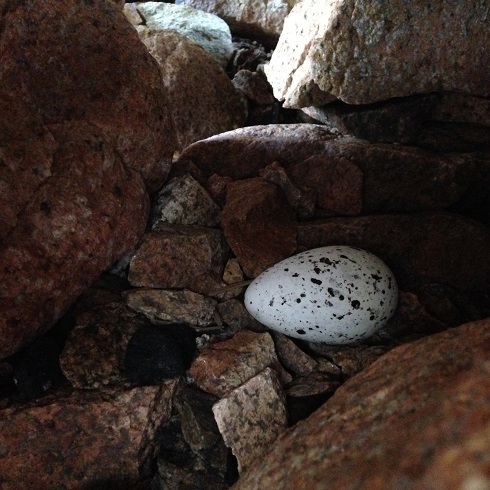 Where once we were seeing large, gleaming white puffin eggs, now chicks with long grey down and white bellies are hiding quietly in their burrows. 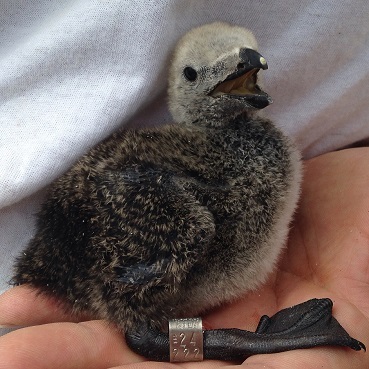 We even have found one razorbill chick (see photo below)! 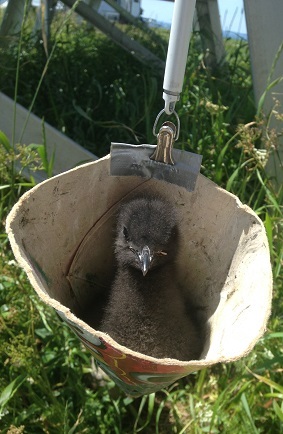 The only seabird still solely in the incubation stage are the Leach’s storm-petrels. 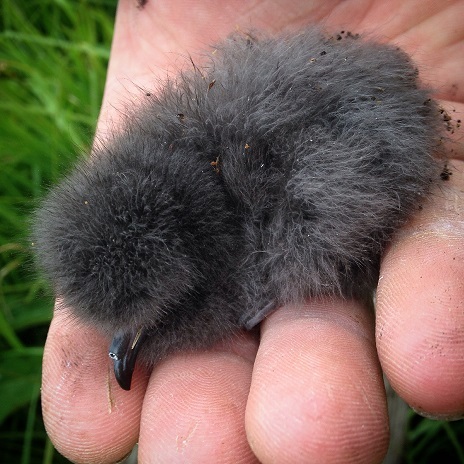 One question that I often get asked is, why do some seabirds only ever hatch one chick (think puffins, razorbills, storm-petrels), while others can rear multiple chicks (terns, guillemots, etc)? In general, seabirds have small clutch sizes compared to birds of other groups like most waterfowl, game birds, and some perching birds. This is because seabirds, unlike the groups mentioned previously, tend to have long life spans. This means it is not quite as critical for seabirds to have a successful nesting season their first breeding season or every year of their life in order to replace themselves in the population. Other bird species may only get one chance to successfully reproduce if annual adult survival is low due to high depredation of adults and/or other factors. But why lay only one egg instead of two or even three? 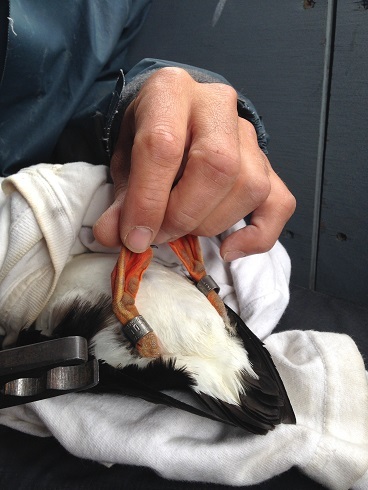 There are multiple factors that influence seabird clutch size, and still many questions to be answered. Chick rearing is very energetically demanding for the parents, from egg formation to providing enough food for growing chicks. Right from when birds arrive on the breeding grounds, food availability is critical. 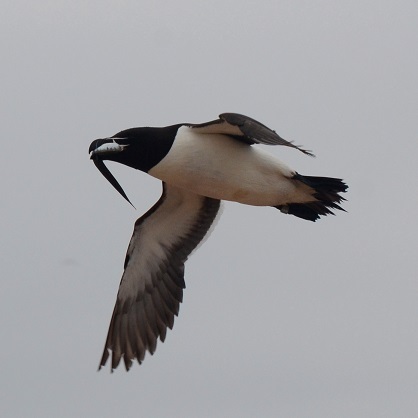 After long migrations or rough winters, seabirds need to be able to find enough resources near their breeding colony to allow them to be in proper condition for breeding. Limited food resources during this period of time can cause birds to lay smaller clutch sizes, or even not nest at all. 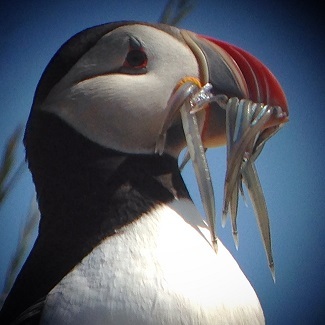 This still does not answer our question why puffins and other species only lay one egg, in both good and bad food years. For species with one egg clutches, it is more beneficial for the long-term survival and breeding success of the adults to raise only one chick at a time. Raising two chicks would probably not be impossible during good food years, but the energetic costs on the parents might make this not worthwhile in the long run. 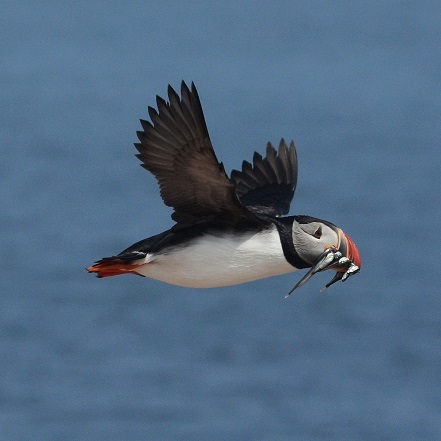 So puffins, razorbills, and many other seabirds prefer to take things slow, laying only one egg per season. Currently, we have found 17 black guillemot chicks, 15 Atlantic puffin chicks, one razorbill chick, and a few hundred tern chicks! As our fifth week comes to an end on PMI, the island is looking more and more like a seabird colony. 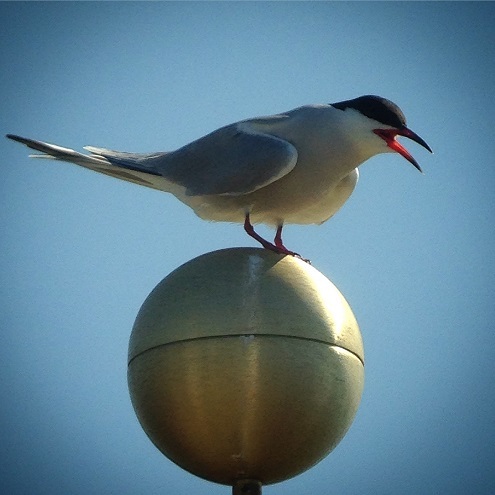 More Arctic and Common Terns appear every day, and so do their nests. 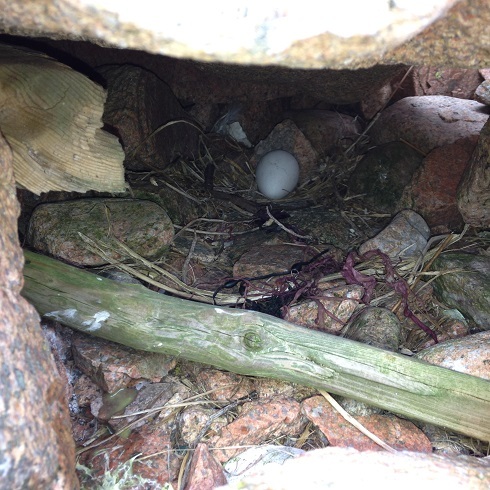 Last week our first Atlantic Puffin, Razorbill and Black Guillemot eggs were found! But this week I’d like to talk about something that is more ever present than the seabirds themselves- marine debris. It’s found all over Petit Manan- some so old that the ground has reclaimed it and the vegetation grows through it. It finds itself lodged between rocks impossible to retrieve, and even ends up in the burrows of the birds we are trying to protect. Although the islands on Maine Coastal Islands NWR are closed to the public during breeding season, trash still lines the shores as a constant reminder of our every day impact. Buoys are a common item to wash ashore on Petit Manan, as well as plastic water bottles, chewing tobacco tins, rope, and bleach jugs. Some of this seems common to local boaters, but the majority of marine debris actually comes far inland and makes its way down through rivers. In the first three weeks on Petit Manan, my co-workers and I collected 840 gallons of trash from the shore. 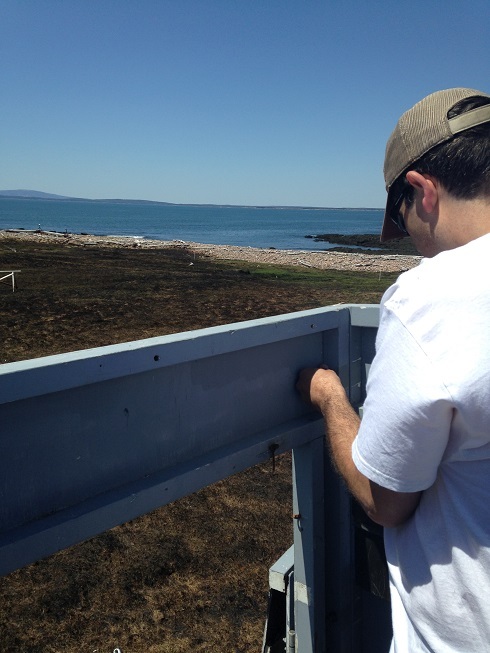 This in addition to the 10 tons of marine debris that refuge boat operator, Jim Fortier, and local Maine volunteers remove annually from Petit Manan Point. Some of our most frequent items include disposable plastic water bottles and other single-use plastic bottles. One afternoon I counted to see just how many water bottles we were picking up, and it averaged out to two water bottles every minute. And they just keep coming ashore. This isn’t just an aesthetic problem. Marine plastics are a growing problem, especially for our seabirds. Plastics don’t biodegrade or decompose into new material, but they do break down. They continue to break down until they become so small that you cannot see them anymore, these are called micro-plastics. These tiny plastics end up being eaten by seabirds, either because their food already has micro-plastics in it, or because of their feeding strategy like those who skim the surface of the water. Last year the Oceans and Atmosphere Business Unit of Australia released a study warning that by 2020 99% of seabird species will have been found to consume plastics, and of those species 95% of the individual in each species will have consumed plastics. This news spells disaster for seabird species. Consumption of larger plastic items can lead to obstruction of the bird’s digestion system and death, while eating smaller plastics takes up space in the birds’ stomachs reducing their food intake and leads to decreased health conditions and starvation. This has also been shown to reduce the survival of fledgling and juvenile seabirds. So marine debris is a real problem, and if nothing is done it is projected to only get worse. In the 11 years from 2015 to 2026 we are expected to create as much plastic, as all the plastic that has been produced since its creation. Fixing this is not just a matter of watching your trash on beach trips, but to reconsider what you buy and how you dispose of your waste. The majority of marine debris comes from trash that is transported from far inland areas by rivers. So my challenge to all you seabird lovers out there is to make a positive change in your life. Take the time to clean up and collect recyclables in an area, because you never know if that trash will make it to the ocean. Use your consumer power and switch from disposable water bottles to a reusable one – by not supporting goods sold in plastic containers you are lessening the demand for those goods in the future. Practice the waste management hierarchy- reduce, reuse, and recycle before ever sending something to the landfill. 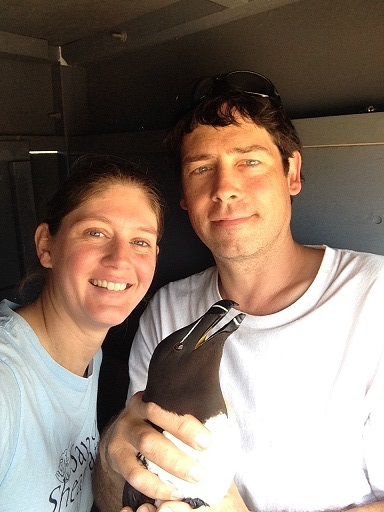 Thanks for all your help in protecting in the seabirds we love! Another year on PMI! After two weeks of cold weather and high winds the terns have finally started to nest. Maybe not in the numbers that we are used to but it’s still early enough for more terns to arrive and settle in for the nesting season. The Alcids on PMI don’t seem to waste any time, Atlantic Puffins and Razorbills have already laid eggs at least 3 days ago and hundreds of Black Guillimots are still prospecting all over the island. Tern eggs are made to blend in with beach materials such as sand, pebbles, and seashells but nesting up and away from the beach can be risky as some tern eggs can stand out against the vegetation and island dirt. Puffin and Razorbill eggs don’t need to be camouflaged as most Alcids nest in deep, dark burrows away from the eyes of arial predators. Puffin eggs are all white and a little smaller than the Razorbill’s bigger, speckled egg. 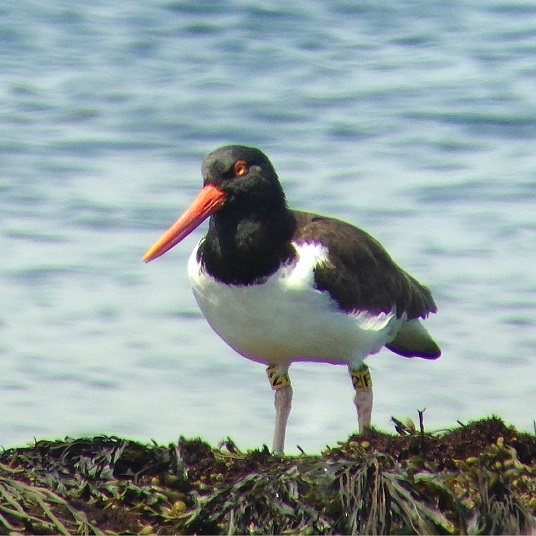 Last week while over on Green Island, which is ajacent to PMI and only accessible at low tide, we resighted an American Oystercatcher! We know they try to nest there every year, but haven’t yet been able to resight one yet. Now with the numbers on his bands we can find out who he is. 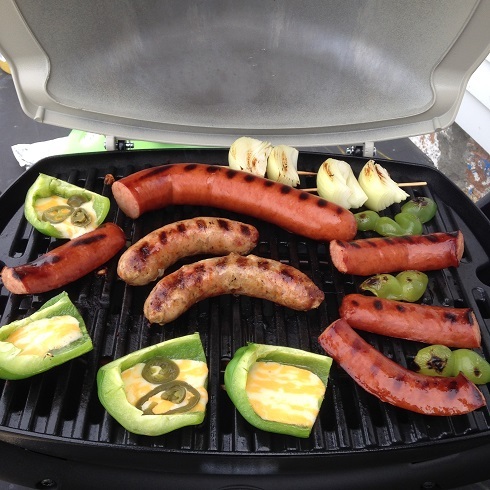 Thanks to MCINWR we have a grill this year! Until next time…. The seabird season has begun! Wayne and I are back for another year on Petit Manan Island near Milbridge, Maine. Two more researchers will be joining us next week, but until then we are getting the island set up and ready for the season! It’s a pretty big process to get all your gear and groceries and research equipment to the island, especially when the water temperature is still in the 40’s. 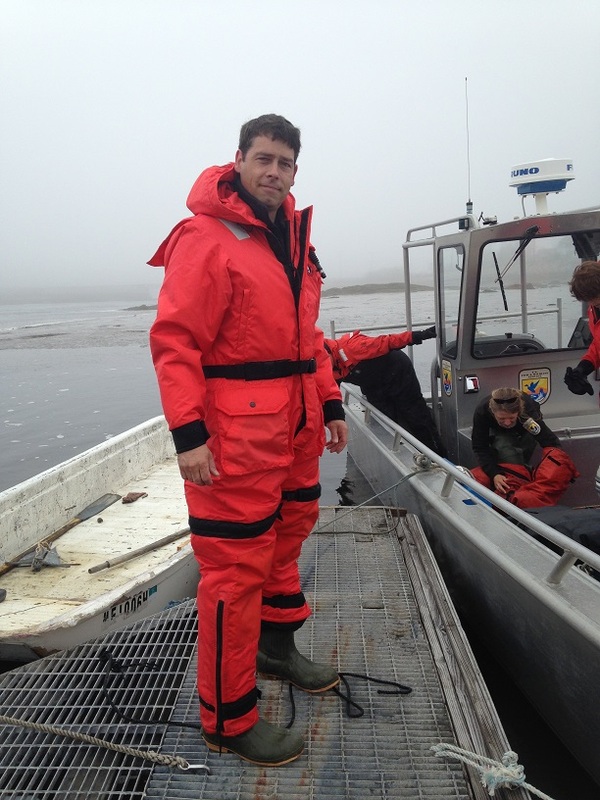 To get here we exchanged our regular float coats for the safer and much bulkier Survival Suits. Wayne sporting his stylish and essential survival suit. Once here with all our belongings, we spent the first week getting reacquainted with the island. The vegetation was burned a few weeks ago in an effort to create more suitable seabird nesting habitat. Green grass is already growing through the burn rapidly, but when we first arrived it looked almost other-worldly. 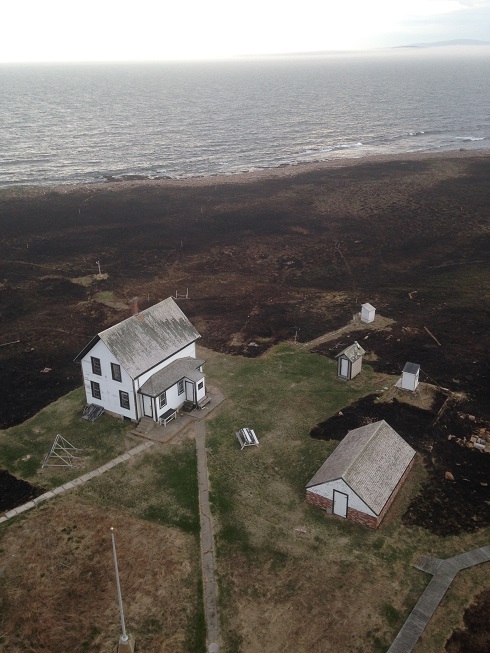 View of the burnt island and our home from the top of the light tower where we conduct our twice-daily bird counts. Other early season tasks include setting up the remainder of the observation blinds. They are built as four separate walls and roof and need to be assembled and disassembled every season. They are held together with bolts and have folding windows on each side for observation. Wayne putting bolts into an observation blind before the roof is attached. We have been keeping an eye out for migration visitors and have been looking through scopes to observe behaviors and find rafts of ducks on the water. So far we have seen 73 species of birds! For the past week we have had extreme wind which seems to have slowed down migration. When we woke this morning the wind was blowing at an average of 23 mph with gusts as high as 37mph! 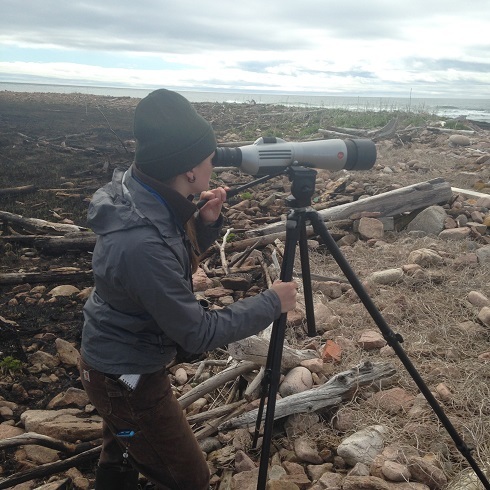 Julia observing Harlequin Ducks through a scope. 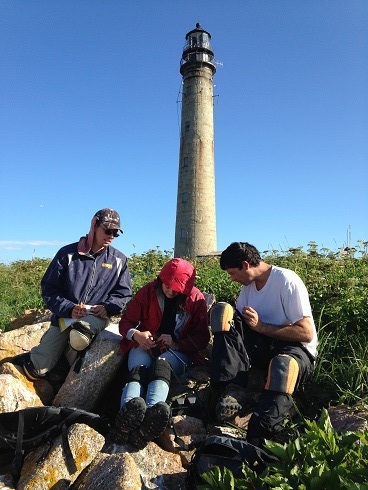 Right now we are anxiously awaiting the permanent arrival of Terns and the first eggs of the Puffins, as well as the arrival of our two additional researchers! More to come later!